← The New Evangelization…the Gospel of “Nice”? With frequent discussions about the shortage of priests in the Catholic Church today, it seemed like a good time to review recent statistics and anecdotal evidence which provides hope for the future. With a presence in only 34 diocese in the United States, the Fraternity still boasts an impressive 80 plus seminarians in North America alone. 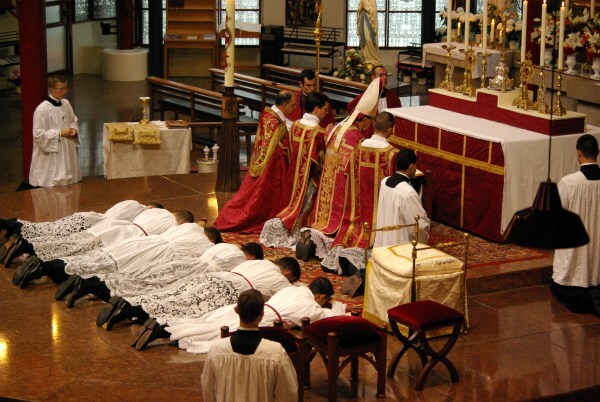 On average the FSSP has ordained 12 priests per year since 2000, numbers which would be the envy of just about any diocese. For the Catholic Church in America the total number of U.S. seminarians has reached levels not seen since the early 1990’s. Georgetown’s Center for Applied Research in the Apostolate (CARA) reports over 3,700 graduate level seminarians in 2012. Additionally, many seminaries are experiencing enrollment levels not seen in the past 30-40 years. Both positive trends and cause for cautious optimism. Where are many of these young men coming from? Not surprisingly many of these seminarians are coming from traditionally minded Catholic dioceses and parishes. On a per capita basis the Diocese of Lincoln, NE has ranked at or near the top in the nation for its ratio of priests to faithful as well as seminarians to faithful. Shepherded by Bishop Fabian Bruskewitz from 1992-2012 the Lincoln diocese is known for actively supporting the Traditional Latin Mass (even before Summorum Pontificum), its refusal to permit girls to serve altar (which continues to this day) and a fierce commitment to orthodoxy among clergy and laity alike. Love for beautiful liturgy. In the case of the Fraternity priests, the Holy Mass is exclusively offered in the Extraordinary Form. 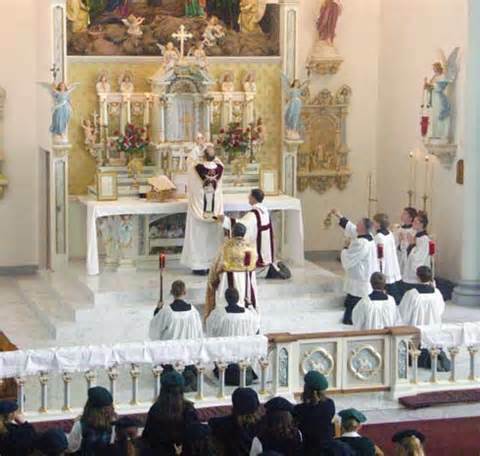 Additionally, the Extraordinary Form of the Roman Rite does not allow for altar girls or Extraordinary Ministers of Holy Communion, something that many traditionally minded parishes also carry over into the Ordinary Form of the Rite. Prayer, specifically Eucharistic adoration, is always present in vocation rich Catholic communities. Clear and unambiguous rejection of contraception. Preached from the ambo, lived by the faithful in the pews. A Catholic community that closes itself off to Life will always struggle for priestly vocations. That is much of the story of the vocation crisis of these past 40 years. Finally, vocation rich Catholic communities love our priests! They are revered simply because they are priest. They are our fathers and our shepherds. We pray for them and they sacrifice for us. We know that our Lord will not abandon His Church. It is our disobedience, not our Lord’s design, that has caused this vocations crisis. Let us cooperate with His will so that once again Holy Mother Church will have an abundance of priests to guide and serve the faithful. May we provide our young men a sacred silence, most of all during the Holy Mass, so that those who are being called by our Lord may hear His voice and respond. St. John Mary Vianney, Patron Saint of parish priests, pray for us! Posted on July 11, 2013, in liturgy. Bookmark the permalink. 10 Comments. Thanks for clarifying some of the differences that you have seen in parishes with strong calls to vocations. Personally undecided about whether boys only or boys and girls should serve at the altar, I do believe that there should be opportunities for children and teens to be involved in the Mass to the best of their abilities. In this aspect, the beauty of the traditional Latin Mass is lost on children and youth who have no understanding of the language it or its history. In addition to the RCIA and RoC that I mentioned in my intro letter, I have also worked with Children’s Liturgy of the Word for 13 years. Women have a different charism, and it is not to preside at the altar. It is in the church of the family where women prepare for the Mass. I have more ideas, but I am tired now, some really long shifts here. I hope you don’t mind. Thank you for your feedback Marie. As always, I appreciate the sincerity and thoughtfulness of your comments. Just from personal experience with my own 5 children, who range from 25 years old down to 3 years old, the Traditional Latin Mass in some ways creates more participation. While they are “doing” less at times in the vocal or physical sense, they are more attentive to what is happening (both exteriorly and interiorly). The silence mixed with sacred music, and the stillness, is quite counter-cultural and therefore actually engages them more. My 13 year old, who enjoys participating in both the Ordinary and Extraordinary forms of the Mass, loves to sing along with the Credo in Latin. Finally, with regards to involvement at Mass: there are great opportunities for young boys and young men to participate through Altar serving. The FSSP parish in Sacramento, CA has just a little over 500 families I have been told (quite a small parish), yet has nearly 70 boys in their altar guild! Here is the link. Great picture! Finally, I would say that young girls and women also have ways to participate. Sacred music, through participation in the schola, is one way that comes to mind. My parish has a St. Maria Goretti altar society to help prepare the Sanctuary/Altar prior to Mass when offered in the Ordinary form. Thank you again for your participation in this blog Marie! Please share this with friends and family as well. God bless! I’m not sure where you go to Holy Mass Marie, but I find that the parishes that take their children out for “Children’s Liturgy of the Word” have children who are lost in the mass period. We have a parish with both NO and a TLM We have no female Altar servers yet have 270 boys that serve the masses. Children fill our TLM, children fill our 5 other NO. None of them are taken out for part of the Mass. They are treated the same as the adults and therefore know and experience the Holy Mass as the rest of us do. I have never liked the practice of taking children out of the mass for the liturgy. It really seems like a protestant type of thing. The mass is not a class room, we are not students when we go to mass, we are witnesses at Calvary. And we should not take out kids out of the mass if we actually believe in what we are participating in. Great article. Once again the traditional Latin Mass shows that it is able to help produce vocations, as well as conversions. And it has been the inspiration for so much beauty the Church has produced in art, music, and architecture throughout the centuries. When I was growing up in Ontario, Canada, boys were altar servers and girls sang in the choir! I always knew I was sooooo privileged to be able to accompany the Holy Sacrifice of the Mass with my voice. How about teaching girls to embroider and the art of making bouquet to adorn the altar of God with their work! How about praying for strong faithful priests! The Church has been “masculinized”, just like women have been because of feminisation! Now women looks like men ( dress and attitude). The church buildings has been stripped of scent ( incense), of beautiful garments ( lace, vestments), of family pictures ( Statues), and love ( devotions, prayers, adoration). No wonder our young men do not find in themselves to serve what looks like a wrench instead of a princess! No wonder the orders who truly love the Bride of Christ and adorn her as such have now vocations. Me too and California leads the way .